For the Staple Singers and Stax Records, political engagement flowed from an artistic renaissance. Pops, Cleo, Yvonne and Mavis Staples perform in a church. The Staple Singers traveled to Ghana in March 1971 as part of a revue featuring American jazz, rock, and rhythm-and-blues artists who wanted to befriend musicians on the other side of the Atlantic. A film documenting the tour, Soul to Soul, is mostly a celebration of shared musical affinities, but one sequence casts the trip in a different light. Right after a scene in which Mavis Staples describes a visit to a former slave dungeon, the group performs “When Will We Be Paid?” The song, written by Randall Stewart, is one of the Staple Singers’ most compelling. Mavis’s deep contralto moan leads a call and response with her sisters Yvonne and Cleotha, while their father, Roebuck “Pops” Staples, supplies a piercing affirmation with his terse guitar licks. The lyrics move from declaring pride in the building of the United States, including wartime service, to decrying the horrors of the Middle Passage and ultimately demanding their redress. Mavis Staples, the Staple Singers, and the March Up Freedom’s Highway. Stax Records and the Soul Explosion. 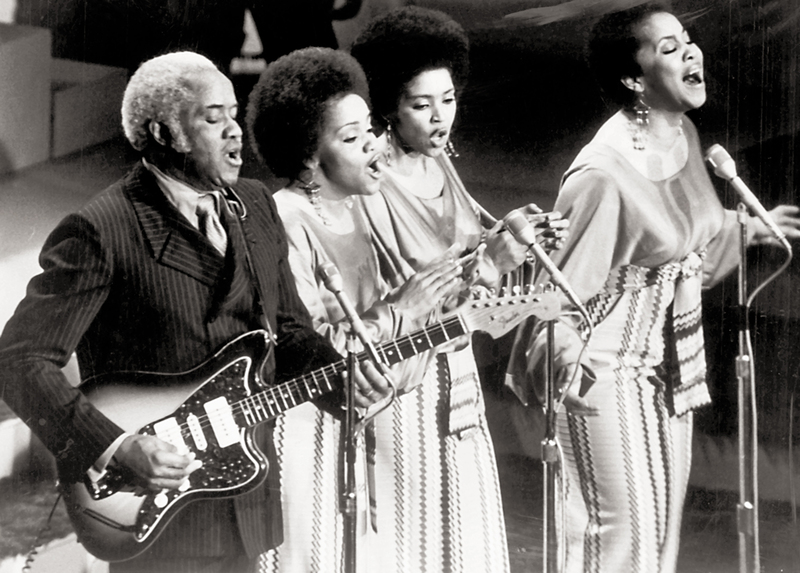 “When Will We Be Paid?” is something of an anomaly in the group’s career, not least because it was omitted from the 1986 compilation The Best of the Staple Singers. They tended to sing about spiritual uplift (“I’ll Take You There”) and self-reliance (the anthemic “Respect Yourself”). But in other ways, “When Will We Be Paid?”—a call for inclusion and an expression of cultural pride as much as an account of historical atrocities—defines not only the essence of the Staple Singers’ repertoire but also the mission of Stax, the Memphis-based record label that became the group’s home. Stax released several of the era’s most potent R&B records and sought a place at the industry’s table as one of the few popular record companies with an African-American owner, a former DJ named Al Bell. The making of “When Will We Be Paid?” also speaks to Stax’s integrationist ethos: its producer and key instrumentalist was the white guitarist Steve Cropper. Pops Staples had little to lose when he organized his children into a gospel group. The young lead singers were a natural draw, but what also stirred up attention on the church circuit was Pops’s tremolo on the electric guitar. Kot describes the effect as “a hypnotic swirl of reverberation, repetition, and riff.” (Staples’s gentle touch made an impression on a teenage musical acquaintance, Curtis Mayfield.) From 1940 to 1960, when the size of Chicago’s black population almost tripled, the Staple Singers’ harmonies recalled one of the few aspects of Southern culture that the city’s African-American urban migrants may have missed about the states they’d left behind. In 1955, the Staple Singers signed with Chicago’s Vee-Jay label, one of the first widely known African-American-owned record companies, and the group was marketed alongside Vee-Jay’s premier catalog of blues, gospel and R&B. This brought them some success, but a recording of a Staple Singers set at the 1962 University of Chicago Folk Festival suggests that they hadn’t abandoned an older style of religious performance favored by purists. While some critics argued that the group’s mid-’60s transition to rock reeked of commercialism, the Staple Singers had higher concerns. Pops wrote “Why? (Am I Treated So Bad)” as a tribute to the black students’ attempts to integrate Little Rock Central High School in Arkansas. The plaintive song became a favorite of Martin Luther King Jr., and the Staples family would later rally crowds on his behalf, especially for Operation Breadbasket. But international popularity was not theirs to enjoy until Al Bell signed them to Stax in 1968. Gordon places Stax’s story in the context of the civil rights movement in Memphis. Jim Stewart, a white banker and amateur country fiddler, established the company in the late 1950s with his sister, Estelle Axton. They set up shop in a black neighborhood and allowed anyone to audition and sometimes record a song. This was about three years before the city’s students undertook to integrate its lunch counters. Many of the musicians who walked through Stax’s doors were around the same age as those students. Multi-instrumentalist Booker T. Jones would go on to form the company’s stellar house band, Booker T. & the MG’s, with guitarist Steve Cropper and drummer Al Jackson Jr. Duck Dunn would soon replace bassist Lewie Steinberg. They were veterans of the area’s bars and juke joints, and their music conveyed a raw essence that was sharpened and refined when Jones studied music formally at Indiana University. Singer Carla Thomas was introduced to the company through her father, Rufus Thomas. The result was a fascinating mix of personalities—from the quietly studious, like Jones, to the older, extroverted entertainers, like Rufus Thomas. Gordon’s resourceful use of lengthy interviews with this cast of players, as well as his sharp wit and vivid imagery, lend Respect Yourself a novelistic texture. Bell joined Stax’s promotion department in the mid-’60s, after he had worked with King in Georgia. Stewart encouraged Bell’s rise into management and co-ownership, but their dream nearly went off the rails in 1968, a few months after Otis Redding, one of their most acclaimed artists, died in an airplane crash in Wisconsin. The misfortunes continued when a distribution deal with Atlantic Records ended with Stax losing possession of its own catalog to the larger company. And that April, King was assassinated at the Lorraine Motel, which had been a work and relaxation spot for Stax musicians. The subsequent riots in Memphis permanently scarred the city, but somehow the Stax studio survived the violent aftermath of King’s death unscathed. Bell’s response to these events was to flood the market with 45s and LPs. Remarkably, the music was not just powerful but also stylistically diverse. Along with signing the Staple Singers, Bell saw Stax songwriter Isaac Hayes (who co-wrote Sam & Dave’s “Soul Man”) emerge as a star whose double albums, among them the blockbuster Shaft, blended dramatic scoring for string sections with his proto-rap delivery. The surviving members of Redding’s backing band, the Bar-Kays, transformed themselves into a hard-edged funk group on the model of Sly & the Family Stone, and Don Davis, a former Motown guitarist, brought new sophisticated arrangements to Stax productions. Political engagement flowed from this artistic renaissance, with Bell writing checks to such organizations as the Urban League and the Angela Davis Defense Fund. In 1972, at the National Black Political Convention in Gary, Indiana, Jesse Jackson drew rhetorical capital from the Staple Singers when he asked the crowd, “When will we get paid for the work we have already done?” That same year, Stax became more visibly active when it organized an event called Wattstax at the Los Angeles Coliseum. Along with presenting a wealth of artists on its roster for a low-price fee, Stax directed the proceeds to charities like the Sickle Cell Anemia Foundation. Onstage, Pops Staples and the gospel singer Rance Allen offered stirring discourses on black history. Hayes exuded megawatt charisma. Many pop-culture historians have pronounced the Hells Angels’ murder of Meredith Hunter at the Altamont Free Concert in 1969 as the end the era’s idealism, yet they’ve ignored the 112,000 people—most of them African-Americans—who attended Wattstax peacefully three years later. Mel Stuart’s documentary film Wattstax features residents of Watts and nearby neighborhoods—as well as Richard Pryor—speaking candidly about race, community and their own aspirations. Stax vice president Larry Shaw and Stuart decided to add these voices from the street after the director screened the concert footage. In the book Party Music, Rickey Vincent connects Stax’s cultural affirmations to black nationalist groups—particularly the Black Panthers and the party’s house band, the Lumpen. But Stax and its artists were hardly revolutionaries: the Bar-Kays’ song “You’re Still My Brother” extends an amicable hand even to a Klansman. Entrepreneurialism was still the main agenda. John KaSandra’s “(What’s Under) the Natural Do” mocked proto-Afrocentric hairstyles and clothing as shallow and lacking business sense. “Respect Yourself” (written by Mack Rice) preached self-sufficiency as gospel. All of this made Stax’s downfall in the mid-1970s especially disheartening. Some of its wounds were self-inflicted, the result of disorganization and reckless spending. But Gordon draws on interviews, court documents and newspaper articles to present a convincing case that racism also contributed to the label’s demise. Stax’s local creditor, Union Planters National Bank, had been guilty of financial malfeasance yet tried to shift the blame, charging Bell with fraud. The black community in Memphis and Operation PUSH responded with a boycott of Union Planters, while Bell was eventually acquitted. Gordon sets this drama against the backdrop of the rise of de facto segregation in 1970s Memphis, when white flight caused the city’s schools to crumble. Stax shut its doors in December 1975, and loyal until the end, the Staple Singers released one of the label’s last singles, “I Got to Be Myself.” Then they recorded on Mayfield’s own Curtom label in Chicago, where they enjoyed a big success with “Let’s Do It Again,” one of the sexiest songs Mayfield wrote. But over the next decade, their audience dwindled, and in the 1980s Mavis Staples found herself trying to get gigs singing ad jingles. Other Stax veterans struggled after the company folded, but Respect Yourself ends on an upbeat note. Gordon explains that about ten years after the Stax building was torn down in 1989, former Stax artist and publicist Deanie Parker began running a nonprofit foundation, Soulsville. This organization partnered with a nearby African-American college, LeMoyne-Owen, and amassed a pool of public funds and private donations to construct the Stax Museum of Soul Music and the Soulsville Charter School on the studio’s former site. While educational inequality persists in Memphis, the school’s graduation success rate offers a reason for hope. Mavis Staples’s career has also rebounded since her family’s induction into the Rock and Roll Hall of Fame in 1999. Her voice is hoarser now, but a quiet, indomitable force pervades such recent albums as You Are Not Alone and One True Vine. A couple of years ago, at the Chicago Blues Festival and at the city’s Americana/rock festival, the Hideout Block Party, a standout song of Staples’s sets was “This Is My Country,” Mayfield’s statement of black pride and inclusion. Mavis added a caustic spoken-word interlude to it, attacking the racism inherent in the Tea Party. Sure, she was preaching to her own choir, but it’s always heartening to see such a spirit unbowed. Aaron CohenAaron Cohen is writing a social history of soul music in Chicago for the University of Chicago Press.